First American Financial Corporation (NYE:FAF), one of the leading global providers of title insurance, settlement services and risk solutions for real estate transactions. They have announced that Fortune and Great Place to Work® have ranked First American among the 2018 Best Workplaces in Texas. Earlier in the year, First American was recognized among the 2018 Fortune 100 Best Companies to Work For®. This year being the third consecutive year that the company made it on that list. “Texas is a competitive marketplace filled with great companies and talented people, so this recognition signals we’re performing well. But, it is our people that deserve the praise, as their daily efforts create the workplace experience at First American,” said Dennis Gilmore, CEO, First American Financial Corporation. He further added that the employees’ integrity, teamwork and commitment to their co-workers, customers, and communities continue to elevate the reputation for innovation and leadership in title insurance and settlement services industry. Great Place to Work, in order to generate the 2018 Best Workplaces in Texas list, applied its data-driven methodology to anonymous Trust Index™ survey responses from more than 28,000 people across a broad range of industries. It involved gauging over 50 factors that impact employees’ experience at work. It included elements like employee pride in the organization’s community impact, faith that their work creates a difference, and feeling that their work has a special meaning. Great Place to Work also analyzed demographic patterns to ensure organizations created great workplaces for all employees, regardless of who they are and what they do. “Texas is the top exporting state in the U.S. and one of the top 10 economies in the world,” said Michael Bush, CEO of Great Place to Work. 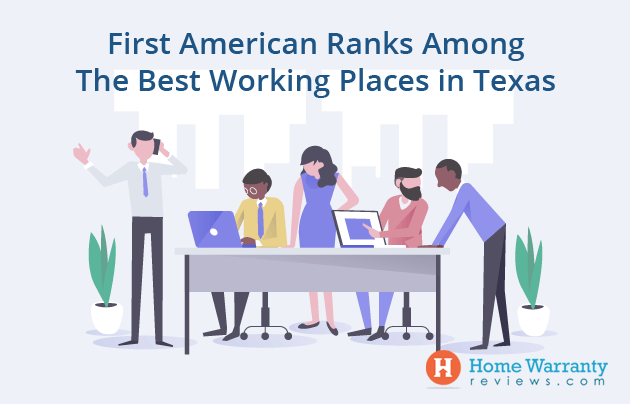 “Texans can be proud that organizations like First American are building the state’s economy by creating great places to work for all,” he added. Last year, Fortune® magazine and Great Places to Work recognized First American as one among the Best Workplaces for Diversity and also as one of the Best Workplaces for Women, as well as one of the 40 Best Workplaces in Financial Services. Since 2012, First American has earned recognition as a “best place to work” 56 times in publications across the United States. FAF’s Canadian subsidiary, FCT, was ranked among the country’s Top 50 Best Workplaces by Great Place to Work for three consecutive years (2015, 2016, and 2017). It was also named among the 2017 Best Workplace in Canada for Women and as one of the Best Workplaces in Financial Services & Insurance. First American Financial Corporation (NYSE:FAF) is a key provider of title insurance, settlement services and risk solutions for real estate transactions. The company was founded in 1889. First American Financial Corporation also provides services like valuation of products, title plant and management services, title and other real property records and images, home warranty products, property and casualty insurance, and banking, trust and investment advisory services. With a total revenue of $5.6 million for the year 2016, it offers its products and services to customers directly through its agents across the US and abroad as well. First American Home Warranty is a member of First American Financial Corporation. The company has established itself as a leading provider of home warranties in the American home warranty industry. The company was nominated for the Top Rated Home Warranty Company award for the years 2017 and 2018 as well as constantly ranks among the Top 10 companies listed on HomeWarrantyReviews.com. It provides its service in 38 states and the Dist. of Columbia, their coverage protects homeowners against costly repairs and replacements of essential home systems and appliances. First American Home Warranty provides its services through a large network of independent prescreened contractors and qualified technicians.